When I talk to my American Muslim friends about Oman, they often say, "Oh the Ibadis, aren't they Khawarij?" Beyond that (contested and somewhat innaccurate) opinion, their knowledge of Ibadis is virtually nil. The reasons for this are many, but at least one reason is the paucity of sources in English from which one might understand more about the Ibadis as a collective, including their beliefs, their ideals, their fiqh, and their historical identity. 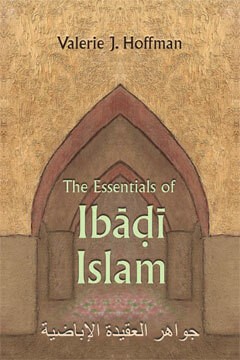 The new book by Valerie Hoffman, The Essentials of Ibadi Islam, aims to change that. It is essentially a translation of two Ibadi texts, one a theological primer called al-Aqeeda al-Wahbiyya by Nasir b. Salim al-Rawahi, and the other a section from Kitab Ma'alim al-Din on The Nature of God's Power, by Abd al-Aziz al-Thamani al-Mus'abi. The two texts work well together, as the first text is unfinished, likely because of the author's death. Hoffman adds a valuable introduction giving historical perspective on the phases of Ibadi history, the rise and fall of the various permutations of the Imamate, and what Ibadis believe. This is a first rate work of scholarship by a serious scholar. Although the theological works will likely be of interest mainly to specialists, as they are highly technical, Hoffman's translation is clear (with in text renderings of Arabic phrasing and extensive footnotes), and the footnotes provide an excellent guide and explanation for those who might not be aware of what they are reading. Muslims curious about Ibadism, scholars of Ibadism in Oman and North Africa, and scholars of Zanzibar will all be interested in this book. It exists in a virtual vacuum of clear English-language introductions to Ibadi beliefs and identity and as such will likely be a reference for years to come, as well as an encouragement to other scholars to expand the English-translated corpus of Ibadi theological, and poetic works.